I seldom comment on a movie, but I so strongly disagreed with a prior comment on this movie, I felt I had to add two cents. I found this entrant far from boring. I have watched it four or five times, each time finding a new focus. The movie's idea is interesting, the conflict between the Sheens believable and well played, and the supporting cast excellent. Laurence Fishburne and James Marshall in particular are pleasures to watch. As the second of Sheen's two stints as a director I was impressed. Even the basic set works for me. And the music is so good that I continue to look from time to time to see if an actual CD is available. I believe that if you get your hands on this movie you won't be disappointed. 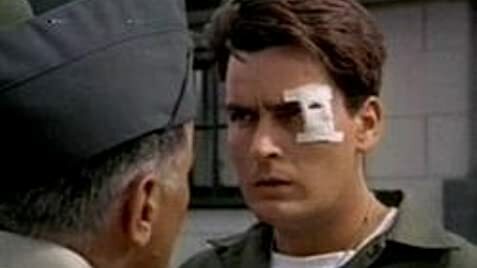 The nametag of the MP behind the reception desk at the psychiatric ward McKinney is sent to after his trial reads "Estevez" - Martin Sheen's original last name, and the last name of his son, Ramon, who plays Pfc. Gessner. When MSG McKinney is talking to Bean during the first "hat clear" check, the boom mic is reflected in McKinney's sunglasses.